Editor’s Note: With so many talented trainers and authorities in the gundog world, it’s a shame that we don’t hear from more of them. So starting with this issue, we’ll be including guest writers in the Hunting Dogs column. George Hickox will remain our Hunting Dogs Editor and a frequent contributor, but from here on he will be joined by some of the other “top dogs” in the business. We hope that you enjoy the additional perspectives. We've put together the full text of the November/December Hunting Dogs column with six videos from the author — below — designed to illustrate specific training tasks and methods. Veteran waterfowl hunters know that hunting with a well-trained dog is a great experience, but hunting with an untrained or unruly dog can range from annoying to downright maddening. It’s easy to blame the dog, but the handler’s lack of preparation is usually the cause. Solid dogwork in the field is the fruit of diligent training. It is impossible to include all of the steps necessary to achieve a well-trained retriever in one article, so I am going to describe how to apply the fundamentals of dog training with an overall approach, and then include some specific tips to help develop a retriever that’s a joy to hunt with. I will go from obedience in daily life to yardwork and steadiness to retriever-specific simulations of the tasks and environment of the hunt. Assuming your dog already has a foundation in training, I will begin with a solid, started dog—one that has had a good puppy training program and at least basic formal training, including force fetch and collar conditioning. Warning: If your dog is not gun-conditioned, does not obey obedience commands off-lead, is not steady or does not perform disciplined retrieves, you have no business bringing it waterfowl hunting. If any of these is this case, enroll your dog in a basic retriever-training program, start working for next year or contact a professional trainer. I’ll begin with a brief explanation of the fundamentals of control and the basics of how to use them. It’s easy to get lost in technical information when explaining training concepts, so I have kept the terminology as basic as possible. Positive reinforcement (PR) is the most powerful element in dog training. PR is the act of the dog handler adding something to the training scenario that pleases the dog when it performs the desired behavior. The common forms of PR are food rewards (treats), attractive activities like retrieving or running free, and praise. To succeed as a trainer, you must learn to incorporate PR as much as possible when your dog behaves to your liking. The first step to harnessing PR is to figure out what your dog likes, then to always make your dog perform a desired behavior to receive it. Three examples are: having the dog sit and wait to be released before being let outside, giving the dog a treat for coming to you when called, and praising the dog when it returns promptly on a retrieve. Considering that a good retriever likes to retrieve, the retrieve itself must be used as PR. Many of the following exercises use the retrieve as motivation—the reward—for good behavior. A well-trained retriever believes that it will not be allowed to retrieve unless it performs perfectly for the handler. The use of correction through some sort of controlled pressure—a choke chain or training collar, for example—is another essential part of a proper training program. Dogs should be taught to understand specific types of corrections during controlled yard sessions through plenty of repetition in the early stages of training. Do not attempt to correct a dog with pressure until you have properly conditioned the dog to understand both what it is being asked and why it is receiving the correction. With this method, the dog learns to avoid correction—pressure—by performing commands properly. Correction should be used only when a dog knows what it is supposed to do and deliberately disobeys. Never use correction when your dog is making an effort and simply makes a mistake. Proper training requires both of these fundamentals, but the driving force should be positive reinforcement. Follow this simple rule when training: When you give a command the dog knows and the dog performs the task correctly, offer PR such as a treat for sitting promptly when asked. If the dog does not perform the task, implement a timely correction. Repeat the command, and when the dog performs the task to avoid the correction, offer positive reinforcement as payment for a job well done. The dog will associate his performance with positive reinforcement and will gravitate toward repeating the success in the future. It is a common misunderstanding that the only time to work on obedience is during organized sessions in the yard. Obedience should be part of a dog’s everyday life and lead to many positive outcomes. Incorporate a bit of obedience every time your dog wants something from you, and insist that the dog obeys before giving it what it wants. You soon will find your companion looking forward to working for you. For example, make the dog sit and stay until released when letting it outside, feeding it, letting it greet guests and retrieving. If you have properly e-collar-conditioned the dog and use the collar successfully and confidently during training, put the collar on the dog while it is in the house. Use the collar when appropriate to make corrections during these intermittent training sessions, and repeat each scenario until the dog is successful. Then, most importantly, give the dog positive reinforcement. A dog that lives under one consistent set of rules in all environments will perform the most consistently. Yardwork is an essential part of any successful training program. It includes obedience and retrieving practice in a controlled setting and allows for consistent reinforcement. Yardwork each day should include obedience and retrieving drills and some days should involve hunting simulations. Always start with obedience, making corrections when necessary, until your dog shows consistent success on each basic command and is calm and focused on you. Now incorporate a retrieving drill into your routine as positive reinforcement for obedience. The easiest way is to give your dog a retrieve after it has completed a task perfectly. There are two general retrieving formats used to achieve this. First, for the calmer dog, the fun retrieve. This is a retrieve that does not require steadiness—where the dog is released before an object is thrown. It is accomplished by verbally releasing the dog while exciting it with playful waving of a dummy, and then throwing it. The fun retrieve will fire up your dog, bringing the excitement of the chase into the work session. Remember: Positive reinforcement is powerful, so use the fun retrieve only when you are happy with your dog’s performance. The second format, for more excitable dogs, is the steady retrieve. This is accomplished by commanding the dog to sit and stay, and then throwing the bumper. The dog is expected to stay in position, and then upon demonstrating steadiness—staying still—the dog is released to retrieve. If your dog is easily excited, use only steady retrieves as PR for obedience. If your dog is slow and deliberate, use the fun retrieve as motivation. Steadiness is when a dog remains stationary until released to retrieve, and it is an absolute necessity in the duck blind. This concept should have been taught to your dog when it was a puppy. Keeping your retriever steady takes consistent maintenance, so make it a part of your dog’s everyday life. When you have completed obedience work, move to a different part of the yard and have the dog sit. If it moves off of the sit command, use a correction until it sits calmly. Once the dog is sitting quietly, begin work on steadiness. Use the concept of denial, where you don’t allow the dog to retrieve until it is calm and focused. Start by tying the dog to a fixed object with no slack in the tether. Throw a steady retrieve. If the dog moves at all upon the throw, walk out and pick up the object. Repeat this process (which you may have to do many times) until the dog calms down, stops moving and almost seems bored. Then untether the dog and throw another retrieve. If the dog does not move, then release it. If the dog attempts to break, stop it with your hands, re-tether it and repeat the process. Your dog will learn quickly that being steady when asked is the only way it will be allowed to retrieve. Soon you will find your dog becoming calmer and more composed faster during retrieving scenarios. Now you may add distractions like duck and goose calls and other loud noises. Remember: If at any time your dog begins losing composure, take the retrieve away and start over. Try this drill with another dog and handler present. Allow the dog that is the most steady to retrieve, and soon you will find your dog patiently honoring other retrievers. • If you are going to have your dog wear a neoprene vest while hunting, have the dog wear it during drills. • To simulate a layout blind, the handler sits on the ground with the dog in between his legs, facing away. 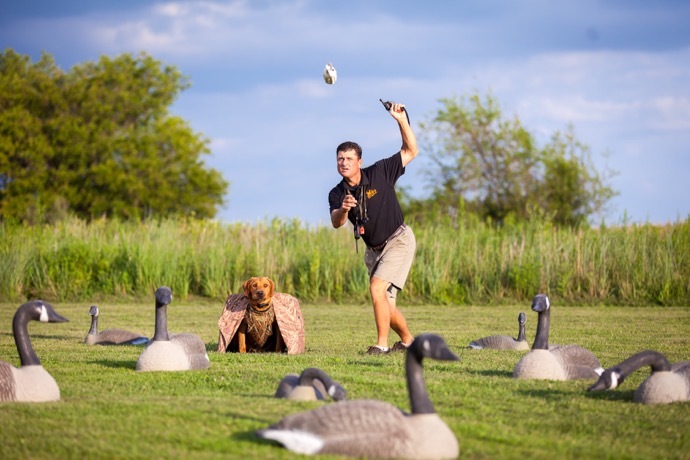 The handler throws retrieves and sends the dog from this position. He receives the birds from a sitting position, and then calls the dog back into the original position for the next retrieve. • To simulate dog platforms found on the exteriors of many duck blinds, build a platform a foot or so off of the ground that is stable and big enough for your dog to comfortably sit on. Help the dog onto the platform a few times with the lead and your hands, if necessary. Once the dog is sitting on the platform, throw a retrieve as positive reinforcement. • Teaching a dog how to work out of a dog hide or field blind (a canvas collapsible kennel) should be performed first in the yard. Start by throwing a dummy into the hide and letting the dog go in to get it. Once the dog has been in a few times and begins to feel comfortable inside, guide it into the hide without the help of a dummy, just as you did when kenneling the dog as a pup. Always reward the dog with a steady retrieve as PR, so that your dog learns as quickly as possible to stay in the dog hide until it is released. Soon the dog will look forward to working in and out of the field blind. • Practice marking with decoys by placing a spread of a variety of decoys in the yard or local pond. Throw retrieves in front of, into and beyond the spread. At first use large white dummies to help your dog visually differentiate. Soon the dog will begin ignoring the decoys and go straight to the mark. Then switch to orange dummies or Dokken Dead Fowl dummies, which are more difficult to see. If your dog handles (does blind retrieves), place decoys inside the boundaries of your favorite handling drill. Soon the dog will be taking good lines and handling within and beyond the spread. If boat rides are part of your hunting, you should incorporate them into your practice. Take your dog along on summertime boating excursions, and make it sit and stay before and after getting into the boat. Give the dog one place in the boat to sit, and practice making it stay there for the duration of the ride. To simulate hunting out of a duck boat, access a small rowboat, put the gunnel end a few feet out into the water and throw steady retrieves out of the back end of the boat into the water. If you have the option, go to your gun club with a few live and dead ducks, pigeons or chukar. 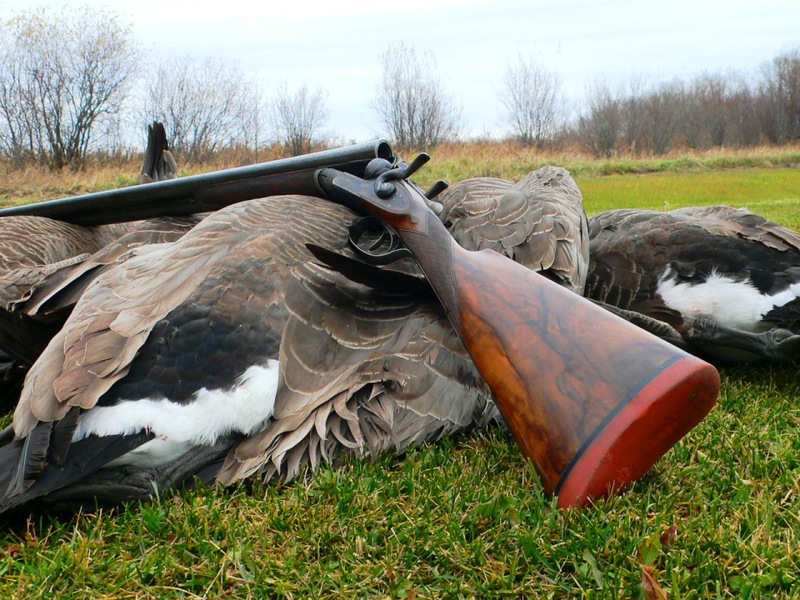 Start with steadiness drills by throwing retrieves with dead birds and shooting into the air. At first tether your dog to a fixed object to prevent breaking, and follow the same instructions for steady retrieves given earlier. Then remove the tether. Just as you did in the yard, take the retrieve away from the dog by picking up the bird if the dog attempts to break. Once your dog is reliable with a dead bird, shoot a live bird under the same pretense. Repeat the same exercises over water and, if possible, out of a duck blind. Properly preparing your dog for waterfowling should be fun and productive for both you and the dog. Following these guidelines will lead you to an enjoyable and hopefully bountiful season with your companion. Dan has owned and operated Green Acres Sportsman’s Club, an exclusive hunting preserve in Central Illinois, for 17 years and has developed a reputation as an excellent dog trainer. Having trained over a thousand dogs of different breeds, Dan has a keen understanding of how dogs think. Dan’s Gun Dog Success Program focuses on harnessing the power of the dog’s instinct and drive as motivation for strong performance, with great effort placed on training the owner to produce a successful dog/handler team. Dan has produced a puppy training instructional video series as a pro staffer for D.T. Systems training equipment.